New rear brake upgrade solution! Brakes From what pads to use to brake upgrades. I bought mine when they first became available but didn't have a chance to mess with them until recently. In addition to the one car I have a second rear end and they wouldn't work on either. Simon was helpful and concerned, but I'm curious to hear if these really did work as intended for anyone out there. He seems to think there is more than one type of rear end. The part numbers don't seem to back that up, but obviously I can't prove that isn't the case. 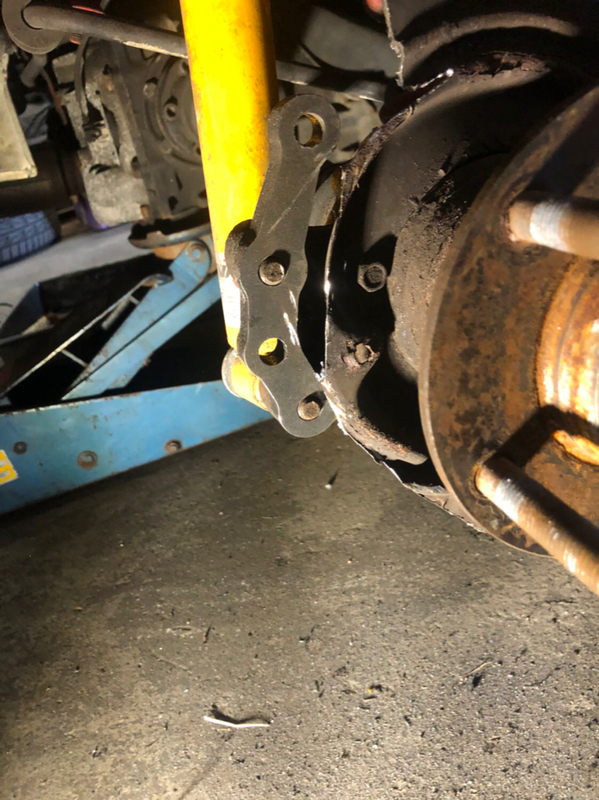 When working with him about my ti, he sent me a set of thinner spacers intended for an e30 (so he says) and they still didn't work with the 128 rotors. He even proved to himself that the 128 rotors don't work as intended on the ti unless you mount the adapter as I have shown in the pictures above. He sent me a set of the thinner ones as well. No dice. I really think the spacer method is the only realistic way of making it work. I'm on the same bus with you guys- my '98 (production day 12/98) needs a spacer as well (~16mm), which I am not that comfortable using for the demands of a track and autocross car. I spoke to Simon a bit about this and he said a CNC option is in the works, but couldn't give me a time-table on it. It sounds like it will be like our solution with the spacers, but machined as one piece. JDL - I doubt that the spacer will be an issue even - it is the same thickness as the knuckles the stock calipers sit on. Go for it and don't look back. If an update is available, can you please let us know here. As for a working solution to what was provided. Use rotors from Z4 3.0si. Were you able to use the existing adapter with or without the spacers for the Z4 rotors? And were you also using the Z4 calipers or the '01-'04 325i calipers? No spacers. I used all Z4 as I had a parts car available to me at that time. I'll check in with him and if I get any updates I'll post them up here. Also, I have an extra pair of E46 calipers and carriers if anyone is looking for them. They're from a 2001 325i IIRC. 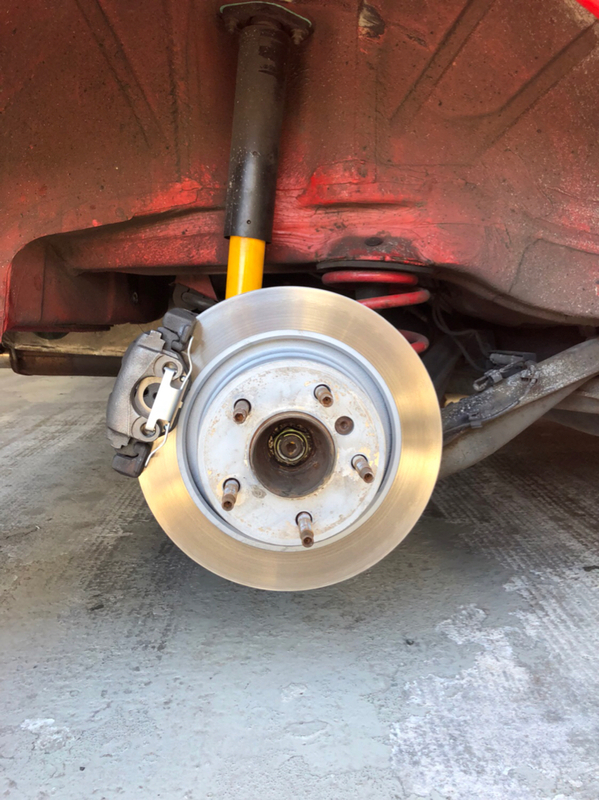 Oh cool- so before I start ordering parts, I can use the Z4 (3.0, '03-'08) rear rotors and calipers using the adapter the way that it was intended (no spacers)? And can you get the parking brake to work? So I just completed this upgrade, and I just have to say if I didn't read this thread again recently I don't know what I would have done. Do not I repeat DO NOT BUY 128I ROTORS OR Z4 CALIPERS, I learned this the hard way. What I ended up using was E46 REAR CALIPERS AND Z4 3.0 ROTORS. This combination seemed to bolt together as intended and the parking brake works. Also I had to pretty much cut the entire back half of the dust shield off as well as the entire curved portion. You have to get pretty close to the parking brake mounting point without going to far. The last issue is the brake line doesn't quite reach, I cut near the hard line mounting bracket and folded it back towards the axle for the line to reach (i know this seems hacked but my car is used as a track car mostly and I don't care to cut it up to make things work) with that said I will try to source longer braided lines or weld the hard line bracket to the swing arm itself. All and all it seems like a solid solution for a rear upgrade if done with careful planning it can be done nice and look OE. Last edited by Deeznutz; 04-22-2018 at 08:02 PM. [QUOTE=Deeznutz;388493]So I just completed this upgrade, and I just have to say if I didn't read this thread again recently I don't know what I would have done. 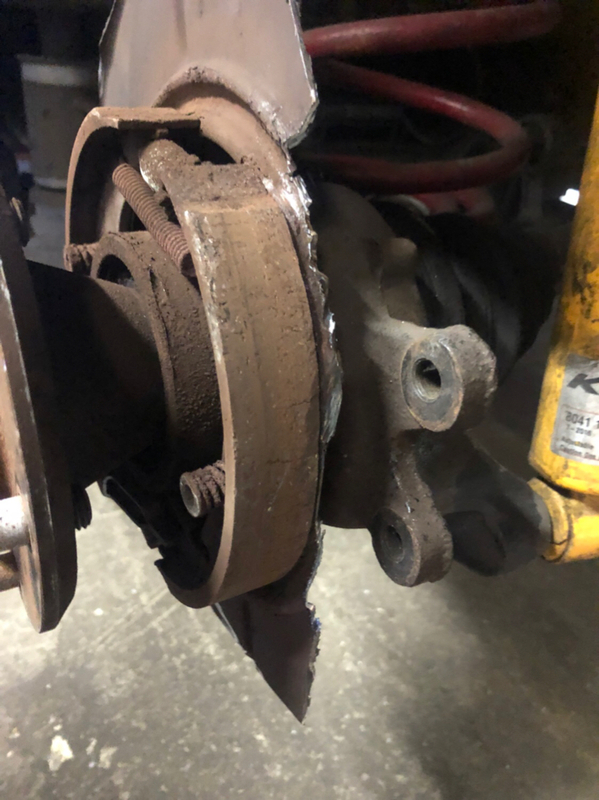 Do not I repeat DO NOT BUY 128I ROTORS OR Z4 CALIPERS, I learned this the hard way. What I ended up using was E46 REAR CALIPERS AND Z4 3.0 ROTORS. This combination seemed to bolt together as intended and the parking brake works. Also I had to pretty much cut the entire back half of the dust shield off as well as the entire curved portion. You have to get pretty close to the parking brake mounting point without going to far. The last issue is the brake line doesn't quite reach, I cut near the hard line mounting bracket and folded it back towards the axle for the line to reach (i know this seems hacked but my car is used as a track car mostly and I don't care to cut it up to make things work) with that said I will try to source longer braided lines or weld the hard line bracket to the swing arm itself. All and all it seems like a solid solution for a rear upgrade if done with careful planning it can be done nice and look OE. I can confirm the the Z4 rear caliper/rotor did NOT work on my ti with production date of 12/98. 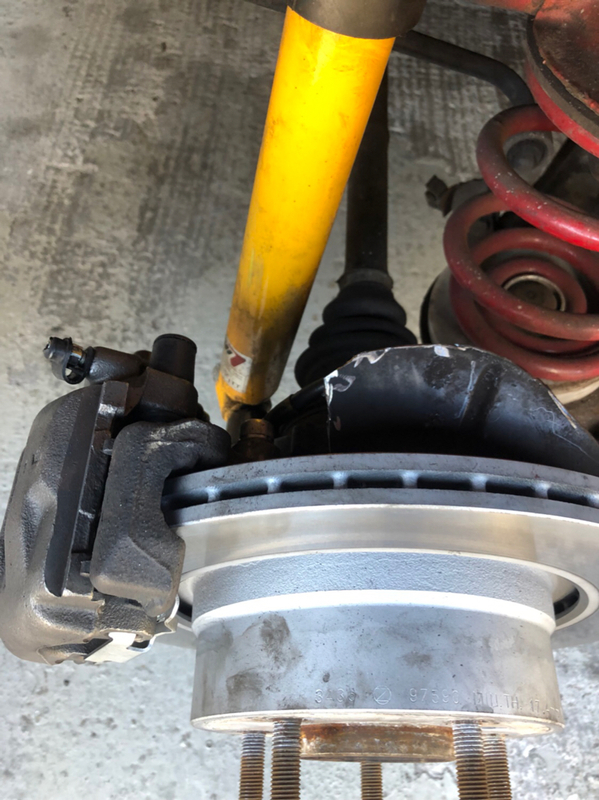 So you used the Z4 3.0 rear rotor with which E46 rear caliper? Was the caliper from the 330, 325, or? Thanks!